Streck cell-free DNA BCT CE blood collection tubes allow isolation of high-quality cell-free DNA (cfDNA) for use in a wide range of applications such as non-invasive prenatal testing (NIPT) and liquid biopsies. Available exclusively in the UK from Alpha Laboratories, they contain a preservative that stabilises nucleated blood cells and prevents the release of genomic DNA (gDNA). Following pressure differential testing performed per IATA UN3373 standards, Cell-Free DNA BCTs have been certified fully 95kPa IATA compliant. This means they can now be paired with the SpeciSafe packaging solution for convenient transportation. This all-in-one secondary packaging system combines ultra-absorbent material bonded to a rigid container with built in tube separation. 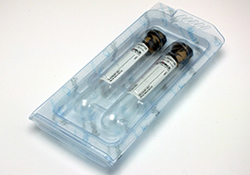 Together with a padded envelope or bag as the outer packaging for road transport, or a rigid outer box for air transport, these mailing packs offer a perfect, compliant solution for transportation of cell-free DNA BCTs containing blood samples.